Premium loop carpet comes with standard yarn binding. Vinyl binding and cloth binding are available as an upgraded option. Cutpile carpet is available upon request, please contact us to order. Carpets do not include the footrest. This Left-hand Drive Carpet is Endura-Wear 7-Piece Carpet Kit with Grommets, with your choice of binding style (yarn, vinyl, or cloth) for the 1968 VW Beetle Sedan. Right-hand Drive Carpet is not currently available. TMI Products Carpet Kits are the industry leaders, used for professional restoration, and include a limited lifetime warranty. These carpet kits are for the sedan only. If you have a convertible, please choose that model instead. Thick, 1/4" pile height. 250 count weave carpet with FLW Backing. Superior wear and stain resistance. Carpet resists fraying and separation. Easy to install. Cut-outs are provided. These carpet kits are for cars without footrests. This premium loop carpet comes with standard yarn binding, but vinyl binding and cloth binding are also available. Available for left-hand drive only. Cloth binding is black by default; if you would prefer Grey, Oatmeal, Brown, or Red cloth binding instead, please indicate that with your order (price is the same). Fits both left-hand and right-hand drive vehicles. Carpeted floor mats are available for cars with or without footrest, please choose accordingly. Carpeted floor mats come with Standard Yarn binding. If you would prefer Cloth or Vinyl binding (additional $10), please contact us to order. Floor mats are non-slip with cloth bound edges. Cloth Binding is available in Black, Grey, Oatmeal, Brown, or Red binding. Vinyl Binding is available in Black or Grey binding. This product is a trunk kit without tire cover, 1 piece. Cloth Binding default color is black, if you would prefer Grey, Oatmeal, Brown, or Red Cloth Binding, please note that when you place your order, price is the same. Vinyl Binding default color is black, if you would prefer Grey Vinyl Binding, please note that when you place your order, price is the same. Replacement tire covers in your choice of Carpet or Vinyl. 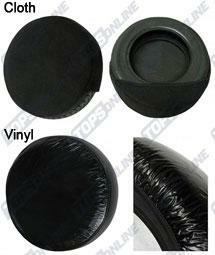 Vinyl tire cover is black vinyl with black vinyl binding. 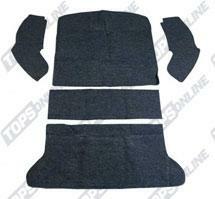 Carpet tire covers come with standard yarn binding. Carpet tire covers with cloth or vinyl binding are available (additional $10). Please contact us to order. I can't thank you enough for your help you're truly a great help. What else do you sell in case I need something else for my car, I rather go to you a TRUE professional!! Thanks.